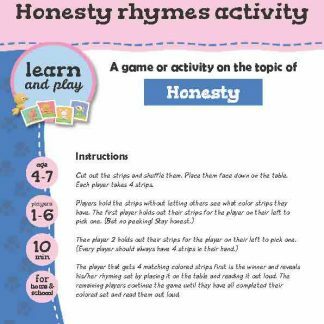 A game activity on the topic of Honesty. 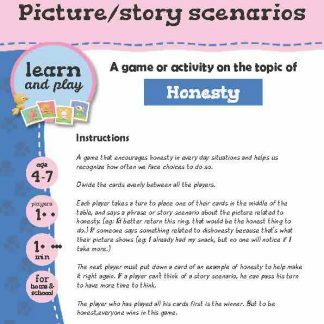 A game that encourages honesty in every day situations and helps us recognize how often we face choices to do so. Divide the cards evenly between all the players. The next player must put down a card of an example of honesty to help make it right again. If a player can’t think of a story scenario, he can pass his turn to have more time to think. The player who has played all his cards first is the winner. But to be honest,everyone wins in this game. Honesty rhymes activity Slides or ladders?